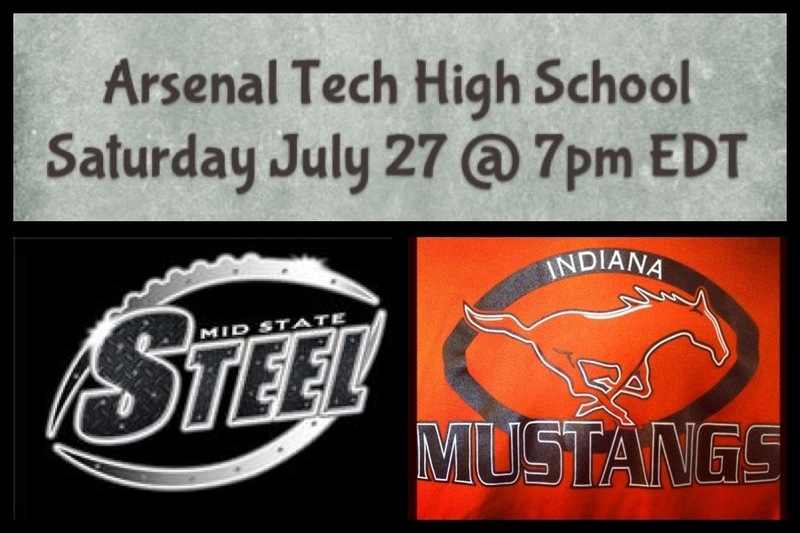 The Indiana Mustangs (1-1) will host the Midstate Steel (0-2) on Saturday, July 27th at Arsenal Technical High School. The gates open at 6 PM, and kickoff is scheduled for 7 PM. Tickets are $8 for adults, $5 for children 7 thru college and seniors 55+ and children 6 and under and all military personnel will receive free admission. Both teams are coming off losses last weekend – the Mustangs lost to the Chicago Thunder in a thunder-storm shortened game 17 – 0, and the Steel lost to Leyden Lions 19 – 13. This weekend’s game is critical since both teams are in the Northeast Division of the MSFL, and the divisional winner receives a first-round bye in the playoffs. The Mustangs are still looking for quality offensive linemen, dedicated volunteers and business sponsors. Advertising opportunities are available ranging from $50 – $2,500. For more information, please contact James Stamper @ 765-681-1327 or Rich Castanias @ 317-379-4669.